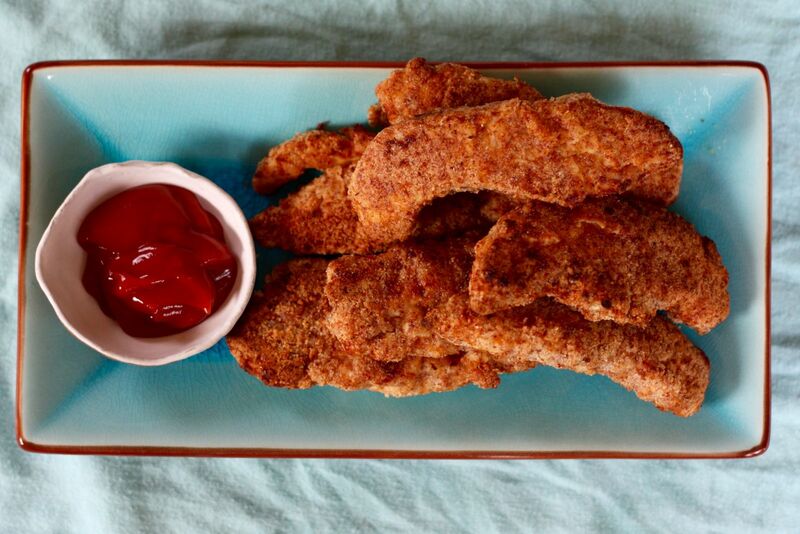 If your kids (or grownups) are chicken-finger lovers, these will hit that spot – but in a more wholesome way, what with their easy oven bakedness and their nutritious coating. Unlike breadcrumbs, almond flour adds protein and crunch, but without a big carb investment. I’m actually wondering about breading and baking cheese sticks this way, because we are such fans of fried mozzarella. I’ll let you know if we try it. 1. Heat the oven to 425°F/218°C. 2. Beat together the egg, buttermilk or yogurt, and ½ teaspoon kosher salt (or ¼ teaspoon table salt) in a shallow dish or pie plate. 3. In another shallow dish, use a fork to stir together the almond meal, garlic powder, cayenne pepper, and 1 teaspoon kosher salt (or ½ teaspoon table salt). 4. One at a time, dip each chicken tender first in the egg mixture, turning to coat, and then in the almond meal mixture, turning to coat well. Using one hand for the egg and one hand for the almond meal helps this be a little less messy and chaotic. Lay the tenders on a rack as you coat them. 5. Spread the oil in a rimmed baking sheet, and put the sheet in the oven to heat for 3 minutes. 6. Carefully move the tenders from the rack into the hot pan, and spray them generously with olive oil spray (or drizzle with extra olive oil if you don’t have spray). 7. Bake for 10 minutes, then flip the tenders over with a spatula and bake for 10-15 more minutes, until the tenders are browned and crisped and cooked through (cut one open if you’re not sure). Cool briefly before serving with ketchup, ranch dressing, or buffalo sauce.